A lung abscess is a subacute infection in which an area of necrosis forms in the lung parenchyma. It usually is in a dependent section of the lung, more often involves the right lung than the left, and is most commonly seen after aspiration of oropharyngeal secretions. Lung abscesses have a slow, insidious presentation and usually develop 1-2 weeks after the initial aspiration event. 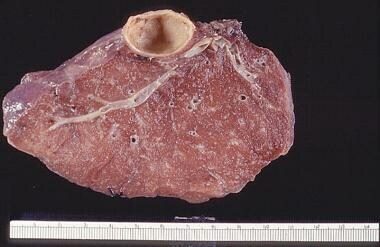 A lung abscess is shown in the image below. Empyema is defined as pus in the pleural space. It typically is a complication of pneumonia. However, it can also arise from penetrating chest trauma, esophageal rupture, complication from lung surgery, or inoculation of the pleural cavity after thoracentesis or chest tube placement. An empyema can also occur from extension of a subdiaphragmatic or paravertebral abscess. 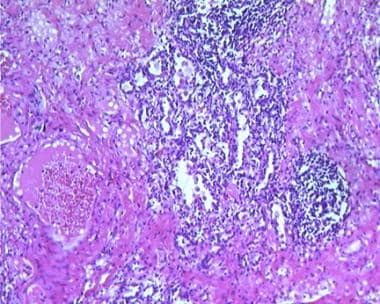 A lung abscess involves the lung parenchyma, whereas an empyema involves the pleural space. In many patients with pneumonia, a sterile simple parapneumonic effusion develops in the pleural space. If this pleural effusion becomes infected, it is labeled a complicated parapneumonic effusion, whereas the presence of frank pus in the pleural space defines an empyema. The development stages of an effusion can be divided into 3 phases: exudative, fibropurulent, and organizational. The initial effusion develops from increased pulmonary interstitial fluid along with progressive capillary vascular permeability. A simple effusion is frequently sterile and resolves with antibiotic treatment of the underlying pulmonary infection. In 5-10% of the patients with a pleural effusion, the effusion becomes infected and neutrophils buildup. This inflammatory response, shown in the images below, also causes the production of chemokines, cytokines, oxidants, and protease mediators. This more complicated parapneumonic effusion requires both antibiotics and some form of surgical drainage or alternative treatment modality to remove the purulent effusion. In these more complicated effusions, decreased fibrinolysis and activation of the coagulation cascade leads to the production of fibrin with subsequent adhesions and loculated fluid collections. This process ultimately can cause pleural fibrosis and impairment of lung expansion. The case fatality rate in the United States for parapneumonic empyema is 7.2%, with rates increasing with age. The fatality rate in children is 0.4%, and is 16.1% in adults older than 64 years. Mortality is increased for hospital acquired, Saureus, gram-negative, and mixed aerobic infections. A population study revealed that nearly 65% of individuals with parapneumonic empyema are male. No studies have revealed male gender as an independent risk factor for empyema. [7, 8] This disparity may be attributed to gender-related risk factors, including alcohol abuse, drug use, and delay to treatment. Lung abscesses are more common in individuals with comorbid conditions often found with increasing age, including dementia and malignancy. Desai H, Agrawal A. Pulmonary emergencies: pneumonia, acute respiratory distress syndrome, lung abscess, and empyema. Med Clin North Am. 2012 Nov. 96(6):1127-48. [Medline]. Grijalva CG, Zhu Y, Nuorti JP, Griffin MR. Emergence of parapneumonic empyema in the USA. Thorax. 2011 Aug. 66(8):663-8. [Medline]. Burgos J, Falco V, Pahissa A. The increasing incidence of empyema. Curr Opin Pulm Med. 2013 Jul. 19(4):350-6. [Medline]. Rahman NM, Davies RJO. Effusions from infections: Parapneumonic effusion and empyema. Light RW, Lee YCG, eds. Textbook of Pleural Disease. 2nd ed. London: Hodder & Stoughton; 2008. 341-366. Chalmers JD, Singanayagam A, Murray MP, Scally C, Fawzi A, Hill AT. Risk factors for complicated parapneumonic effusion and empyema on presentation to hospital with community-acquired pneumonia. Thorax. 2009 Jul. 64(7):592-7. [Medline]. Byington CL, Spencer LY, Johnson TA, Pavia AT, Allen D, Mason EO, et al. An epidemiological investigation of a sustained high rate of pediatric parapneumonic empyema: risk factors and microbiological associations. Clin Infect Dis. 2002 Feb 15. 34(4):434-40. [Medline]. Barmparas G, DuBose J, Teixeira PG, Recinos G, Inaba K, Plurad D. Risk factors for empyema after diaphragmatic injury: results of a National Trauma Databank analysis. J Trauma. 2009 Jun. 66(6):1672-6. [Medline]. Gadkowski LB, Stout JE. Cavitary pulmonary disease. Clin Microbiol Rev. 2008 Apr. 21(2):305-33, table of contents. [Medline]. Ko WC, Paterson DL, Sagnimeni AJ, Hansen DS, Von Gottberg A, Mohapatra S, et al. Community-acquired Klebsiella pneumoniae bacteremia: global differences in clinical patterns. Emerg Infect Dis. 2002 Feb. 8(2):160-6. [Medline]. [Full Text]. Maskell NA, Batt S, Hedley EL, Davies CW, Gillespie SH, Davies RJ. The bacteriology of pleural infection by genetic and standard methods and its mortality significance. Am J Respir Crit Care Med. 2006 Oct 1. 174(7):817-23. [Medline]. Chen HJ, Yu YH, Tu CY, Chen CH, Hsia TC, Tsai KD. Ultrasound in peripheral pulmonary air-fluid lesions. Color Doppler imaging as an aid in differentiating empyema and abscess. Chest. 2009 Jun. 135(6):1426-32. [Medline]. Jaffe A, Calder AD, Owens CM, Stanojevic S, Sonnappa S. Role of routine computed tomography in paediatric pleural empyema. Thorax. 2008 Oct. 63(10):897-902. [Medline]. [Guideline] Balfour-Lynn IM, Abrahamson E, Cohen G, Hartley J, King S, Parikh D. BTS guidelines for the management of pleural infection in children. Thorax. 2005 Feb. 60 Suppl 1:i1-21. [Medline]. Porcel JM, Vives M, Esquerda A. Tumor necrosis factor-alpha in pleural fluid: a marker of complicated parapneumonic effusions. Chest. 2004 Jan. 125(1):160-4. [Medline]. Odeh M, Sabo E, Srugo I, Oliven A. Correlation between levels of tumour necrosis factor-alpha and levels of pH, glucose, and lactate dehydrogenase in parapneumonic effusions. J Infect. 2005 Feb. 50(2):114-9. [Medline]. Rezaeetalab F, Parizadeh SM, Esmaeely H, Akbari H, Akbari F, Saberi S. Tumor necrosis factor alpha and high sensitivity C-reactive protein in diagnosis of exudative pleural effusion. J Res Med Sci. 2011 Nov. 16(11):1405-9. [Medline]. [Full Text]. Merritt RE, Shrager JB. Indications for surgery in patients with localized pulmonary infection. Thorac Surg Clin. 2012 Aug. 22(3):325-32. [Medline]. Hyeon Y. Management of Pleural Effusion, Empyema, and Lung Abscess. Semin Intervent Radiol. March 2011. 28(1):75-86. Cameron R, Davies HR. Intra-pleural fibrinolytic therapy versus conservative management in the treatment of adult parapneumonic effusions and empyema. Cochrane Database Syst Rev. 2008 Apr 16. CD002312. [Medline]. Maskell NA, Davies CW, Nunn AJ, Hedley EL, Gleeson FV, Miller R, et al. U.K. Controlled trial of intrapleural streptokinase for pleural infection. N Engl J Med. 2005 Mar 3. 352(9):865-74. [Medline]. Kokoska ER, Chen MK. Position paper on video-assisted thoracoscopic surgery as treatment of pediatric empyema. J Pediatr Surg. 2009 Jan. 44(1):289-93. [Medline]. Schneider CR, Gauderer MW, Blackhurst D, Chandler JC, Abrams RS. Video-assisted thoracoscopic surgery as a primary intervention in pediatric parapneumonic effusion and empyema. Am Surg. 2010 Sep. 76(9):957-61. [Medline]. Anstadt MP, Guill CK, Ferguson ER, Gordon HS, Soltero ER, Beall AC Jr, et al. Surgical versus nonsurgical treatment of empyema thoracis: an outcomes analysis. Am J Med Sci. 2003 Jul. 326(1):9-14. [Medline]. Bartlett JG. Anaerobic bacterial infections of the lung and pleural space. Clin Infect Dis. 1993 Jun. 16 Suppl 4:S248-55. [Medline]. Benjamin GC. Aspiration pneumonia, lung abscess and empyema. Emerg Med. 1992. 276-8. Chapman SJ, Davies RJ. Recent advances in parapneumonic effusion and empyema. Curr Opin Pulm Med. 2004 Jul. 10(4):299-304. [Medline]. Chen W, Lin YC, Liang SJ, Tu CY, Chen HJ, Hang LW. Hospital-acquired thoracic empyema in adults: a 5-year study. South Med J. 2009 Sep. 102(9):909-14. [Medline]. Chin NK, Lim TK. Controlled trial of intrapleural streptokinase in the treatment of pleural empyema and complicated parapneumonic effusions. Chest. 1997 Feb. 111(2):275-9. [Medline]. [Guideline] Colice GL, Curtis A, Deslauriers J, Heffner J, Light R, Littenberg B, et al. Medical and surgical treatment of parapneumonic effusions : an evidence-based guideline. Chest. 2000 Oct. 118(4):1158-71. [Medline]. Cowen ME, Johnston MR. Thoracic empyema: causes, diagnosis, and treatment. Compr Ther. 1990 Oct. 16(10):40-5. [Medline]. Davies CW, Gleeson FV, Davies RJ,. BTS guidelines for the management of pleural infection. Thorax. 2003 May. 58 Suppl 2:ii18-28. [Medline]. Houston MC. Pleural fluid pH: diagnostic, therapeutic, and prognostic value. Am J Surg. 1987 Sep. 154(3):333-7. [Medline]. Huang HC, Chang HY, Chen CW, Lee CH, Hsiue TR. Predicting factors for outcome of tube thoracostomy in complicated parapneumonic effusion for empyema. Chest. 1999 Mar. 115(3):751-6. [Medline]. Hughes CE, Van Scoy RE. Antibiotic therapy of pleural empyema. Semin Respir Infect. 1991 Jun. 6(2):94-102. [Medline]. Kohan JM, Poe RH, Israel RH, Kennedy JD, Benazzi RB, Kallay MC, et al. Value of chest ultrasonography versus decubitus roentgenography for thoracentesis. Am Rev Respir Dis. 1986 Jun. 133(6):1124-6. [Medline]. Light RW. Pleural diseases. Dis Mon. 1992 May. 38(5):261-331. [Medline]. Miller KS, Sahn SA. Chest tubes. Indications, technique, management and complications. Chest. 1987 Feb. 91(2):258-64. [Medline]. Pennza PT. Aspiration pneumonia, necrotizing pneumonia, and lung abscess. Emerg Med Clin North Am. 1989 May. 7(2):279-307. [Medline]. Petrakis IE, Kogerakis NE, Drositis IE, Lasithiotakis KG, Bouros D, Chalkiadakis GE, et al. Video-assisted thoracoscopic surgery for thoracic empyema: primarily, or after fibrinolytic therapy failure?. Am J Surg. 2004 Apr. 187(4):471-4. [Medline]. Richardson JD, Carrillo E. Thoracic infection after trauma. Chest Surg Clin N Am. 1997 May. 7(2):401-27. [Medline]. Sanford JP, Gilbert DN, Moellering RC. Guide to Antimicrobial Therapy. 2006. 28-9. Schiza S, Siafakas NM. Clinical presentation and management of empyema, lung abscess and pleural effusion. Curr Opin Pulm Med. 2006 May. 12(3):205-11. [Medline]. Schultz KD, Fan LL, Pinsky J, Ochoa L, Smith EO, Kaplan SL, et al. The changing face of pleural empyemas in children: epidemiology and management. Pediatrics. 2004 Jun. 113(6):1735-40. [Medline]. Wiedemann HP, Rice TW. 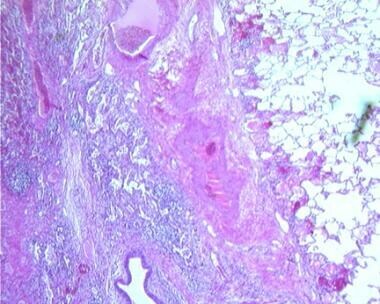 Lung abscess and empyema. Semin Thorac Cardiovasc Surg. 1995 Apr. 7(2):119-28. [Medline]. Wurnig PN, Wittmer V, Pridun NS, Hollaus PH. Video-assisted thoracic surgery for pleural empyema. Ann Thorac Surg. 2006 Jan. 81(1):309-13. [Medline]. A 42-year-old man developed fever and production of foul-smelling sputum. He had a history of heavy alcohol use, and poor dentition was obvious on physical examination. Lung abscess in the posterior segment of the right upper lobe was demonstrated on chest radiograph. CT scan shows a thin-walled cavity with surrounding consolidation.